Can a New 'Vaccine' Stem the Frog Apocalypse? A deadly fungus that’s been devastating frog populations is still spreading across the globe. In California, the chytrid fungus has moved inexorably across the Sierra Nevada from west to east, leaving thousands of frogs dead. 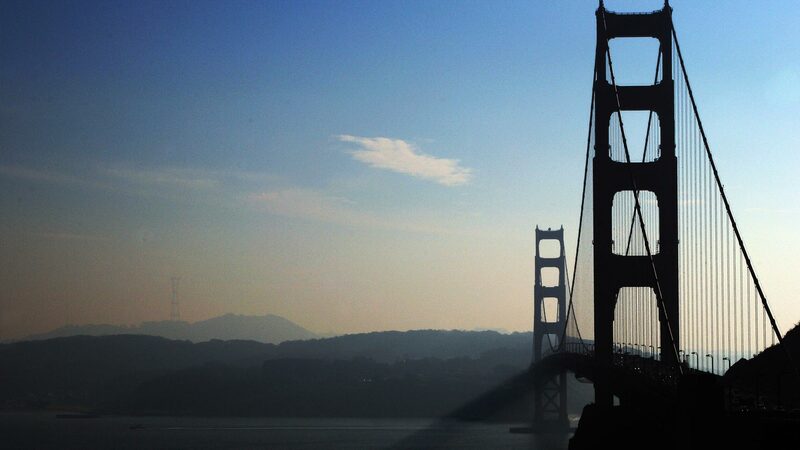 But Bay Area scientists are trying to turn the tide against the fungus with an experimental treatment, one that could matter to frogs worldwide. They’re making a last-ditch effort to save the endangered mountain yellow-legged frog by immunizing it against chytrid. 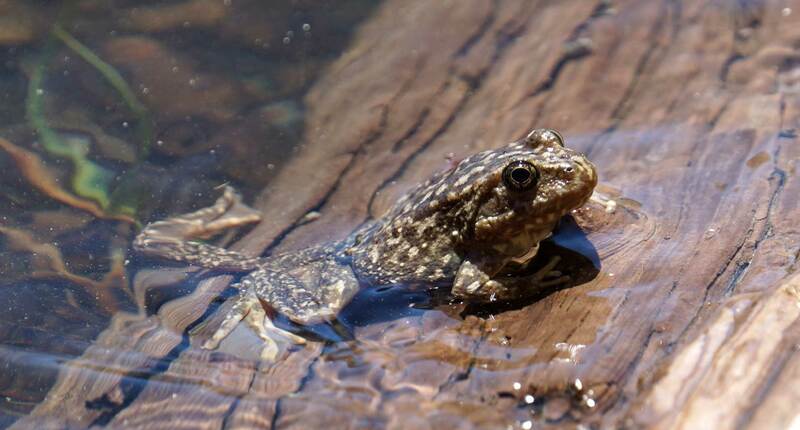 Mountain yellow-legged frogs, found only in California’s alpine lakes, have been in steep decline due to the fungus as well as predation by non-native trout. More than 90 percent of the population has disappeared. Video produced by Gabriela Quirós. “When it hits, it’s within weeks that they’re just gone, just literally gone,” says Jessie Bushell, director of conservation at the San Francisco Zoo. 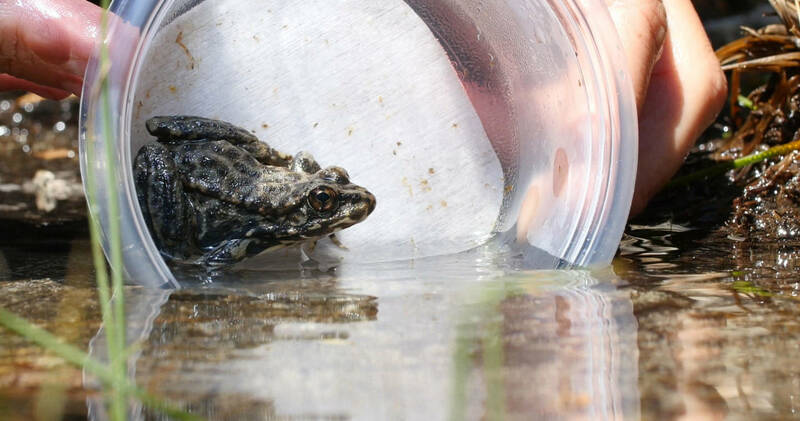 Bushell is part of an emergency search-and-rescue operation for the frogs. Like last summer, when she got up before dawn and drove five hours to meet a helicopter flying out of the Sierra Nevada. The coolers were holding hundreds of wiggling, green tadpoles, the sole survivors of a deadly outbreak at their remote alpine lake. Federal biologists had found dozens of frogs dying from chytrid fungus and, hoping to save the species, had collected their remaining young. Bushell brought them to the San Francisco Zoo. Scientists there and at the Oakland Zoo are doing an experimental treatment on the frogs in the hope that they’ll survive when they return to the wild. The treatment was pioneered at UC Santa Barbara, where results have been encouraging. 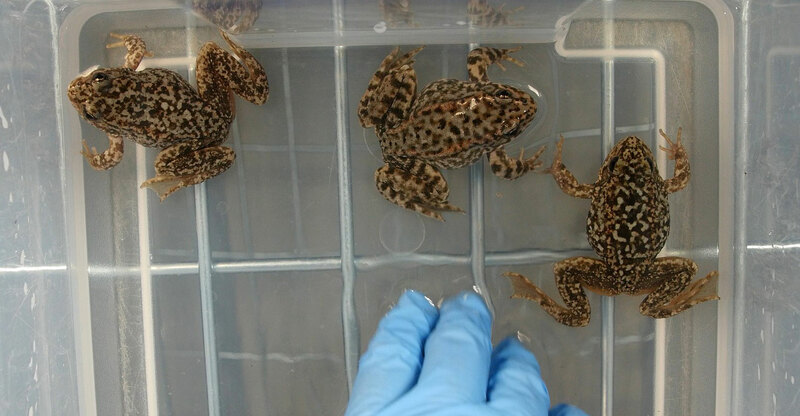 “So what we do is we expose them to small amounts of this fungus,” Bushell says, pointing to more than 200 of the frogs, no longer tadpoles, in quarantined tanks. Bushell is making the frogs sick in the hope of building their immunity to chytrid fungus, which attacks the frog’s skin. 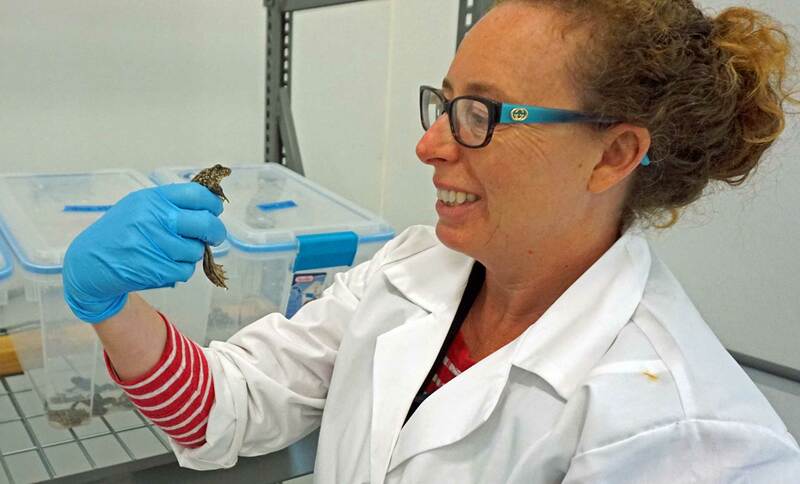 Bushell is hoping a mild fungal infection will teach the frogs’ immune systems how to fight chytrid. She lets her frogs get sick, but before they get too close to dying, she gives them an anti-fungal treatment to clear up the infection. “Their bodies identify it and can already be primed to fight off that infection, at least to keep it under control because they’ve seen it before,” she says. But chytrid fungus is there, so their immunity will be tested. One-by-one, the team releases each frog on the water’s edge. 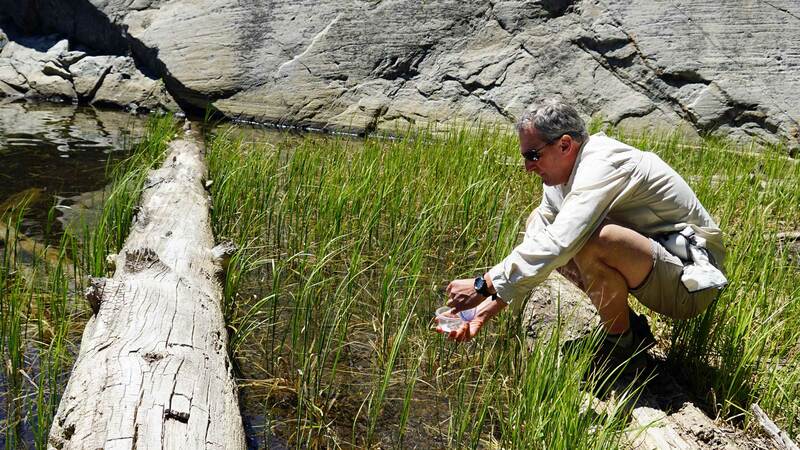 “It’s the best chance that we know how to give them,” says Roland Knapp, a biologist with UC Santa Barbara who has tracked frog die-offs across the Sierra as the chytrid wave has moved through. That threat is why biologists are going to such lengths to save yellow-legged frogs. But he says the early results are promising. This is the third summer the team has released vaccinated frogs. “They seem to be surviving pretty well,” he says. If the immunized frogs survive the worst of the fungus outbreak, the mountain yellow-legged frogs may eventually be able to become resistant to it on their own, generation-after-generation, without human help. “That means we have to figure out ways to keep these frogs on the landscape with the chytrid long enough that evolution can actually happen,” Knapp says. The biggest hope, and the biggest question mark, is whether this research could lead to a treatment for other frog species. Some frogs don’t seem to be able to build immunity to chytrid like the yellow-legged frogs can. Scientists have watched chytrid fungus spread across the globe at an alarming rate, driving 200 frog species to extinction. In Central America, scientists have brought some frog species into captivity to spare them. Today, that’s the only place they exist. And they don’t have much hope of going back to the wild unless some kind of chytrid treatment succeeds. It’s not hopeless, scientists say, but it could depend in large part on the survival of one California frog.